Bactericidal cleansing lather. Free from solvents, harsh chemicals, perfumes and dyes. Ideal for the food industry where a sanitising soap is essential. 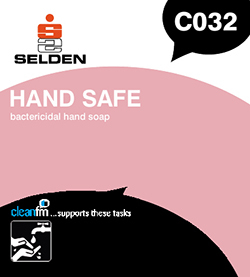 This mild yet effective soap is suitable for a wide range of industries: engineering, automotive, construction, manufacturing, janitorial, healthcare, education and nurseries, printing working etc. Wet hands, dispense a small amount of hygienic onto hands, wash thoroughly - paying careful attention to between fingers and nails - rinse and dry.